It’s hard to believe that July, 18th, 2018 would have been Nelson Mandela’s 100th birthday. Undoubtedly the most famous anti-apartheid activist in the world, Mandela served 27 years in South Africa’s prison system and later in 1994 became the country’s first black president. He is the definition of a fighter and survivor. 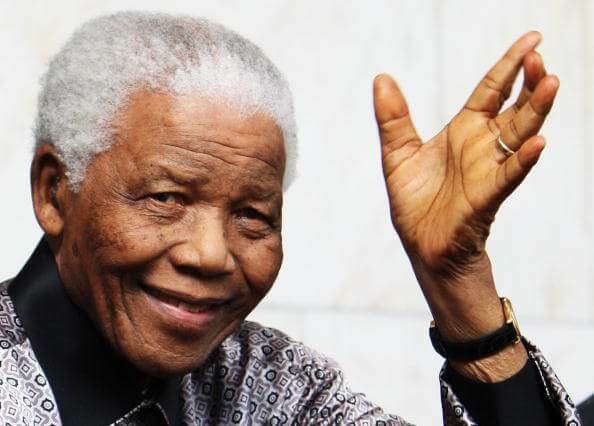 Mandela died in 2013 at the age of 95. He lived a long life, especially for someone who lived in such deplorable conditions and stress. But long before his death, he suffered from a recurring lung infection that caused him to be hospitalized multiple times. According to a 2013 report, Mandela was diagnosed with early stage tuberculosis in 1988 during his prison term. Tuberculosis is an infectious disease that usually attacks the lungs. "When the report came back from hospital they indicated that fortunately we sent the specimen before there were holes in the lung," Mandela said in 2004, according to the report. But after his release from prison and as Mandela got older, he continued to have lung and respiratory issues. At one point, he also battled pneumonia. In January of 2011, he was hospitalized for an acute respiratory infection. He was eventually released in stable condition, but in 2012 reportedly had to receive weeks of treatment for a lung infection. At one point he was said to have spent nearly three months in the hospital to treat this lung infection, and he still had to receive intensive care when he was finally home. His cause of death in 2013 was due to a lung infection (a respiratory infection). He was reported to have been on assisted breathing and life support. So let’s try to understand exactly what a respiratory infection is. Infection can affect the upper respiratory system (which starts at your sinuses and ends at your vocal chords), or it can affect the lower respiratory system (which starts at the vocal cords and ends at the lungs). The common cold is usually considered an upper respiratory infection. Pneumonia is considered a lower respiratory infection. To many people, respiratory infections are not life-threatening. On the other hand with babies, people with compromised immune systems and, as we have seen with Mandela, older people, respiratory infections can be very dangerous. Quite often, these infections are viral and, therefore, cannot be treated with antibiotics. This means it is up to your immune system to fight off the infection. But older people generally have weakened immune systems. According to the Centers for Disease Control and Prevention (CDC), the leading causes of death among persons aged 65 and over are heart disease, cancer and chronic lower respiratory disease. Chronic lower respiratory disease is what Nelson Mandela struggled with. It was a recurrent (chronic) infection that affected his lungs (part of the lower respiratory system). First thing’s first: we all have to be proactive about keeping our lungs healthy in order to help prevent respiratory tract infections. Avoiding as much as possible harmful environmental factors such as smoke, dust and chemicals. Exercise. The purpose of your respiratory system is to bring oxygen into your body and help remove carbon dioxide. If you have an issue with your respiratory system, this can reduce the amount of oxygen to your lungs and make you sick. Exercise increases the amount of exercise going into the lungs and may help improve your lung capacity and lung function. Eat healthily. A nutrient-rich diet with all of the essential vitamins and minerals will help keep your respiratory tract healthy. Minerals such as magnesium, selenium and zinc may even help reduce your risk of lung cancer. Drink plenty of water. Water helps give a thin consistency to the mucus lining in your airways and lungs. This will help with better breathing. Surround yourself with plants. Some reports say plants filter out the air in your environment. Keep plants in your home and office. Practice good oral hygiene. The American Lung Association says that good oral hygiene can protect your mouth from germs that can lead to infection. Always brush and floss at least twice a day. Practice breathing exercises. “Like aerobic exercise improves your heart function and strengthens your muscles, breathing exercises can make your lungs more efficient,” says the American Lung Association. An added bonus is breathing exercises may help promote relaxation and reduce stress. And if you already suffer from lung disease, such as asthma, know that nutrition can significantly help with your condition and help keep your lungs healthy. Vitamins and minerals that may help include omega 3’s, vitamin C, vitamin D, vitamin E, folate and selenium. A good rule of thumb is to eat plenty of antioxidants, which are plentiful in colorful plant-based foods. “Normally the lung exists in an oxygen-rich environment balanced by the toxicity of oxidants and the protective activities of antioxidants. Research has been done in chronic lung disease which hypothesized that a diet low in antioxidants may reduce the natural defense of the lungs against inflammation,” according to this source. And older people have to be especially proactive about protecting their immune systems, in order to prevent infections of the respiratory tract. It’s important to keep in mind that many older people tend to take both prescription and over-the-counter (OTC) medications. These medications may deplete the body’s store of essential vitamins and minerals. Furthermore, an older adult’s body tends to have more difficulty absorbing nutrients from the foods we eat. For all of these reasons, it is extremely important to take advantage of nutritional testing. This testing may determine if you have any nutrient imbalances (a deficiency or too much of a certain nutrient). If you discover you have any imbalances, you can work with a competent healthcare professional to possibly tweak your diet and/or take good quality supplements. In some cases, it may be necessary to include vitamin infusions.